Have you ever watched a runner go by? They can make it look so easy with so little effort. Having completed a marathon (26.2 miles) I can tell you during my training there were times when I experienced effortless breathing. That is not the case however when you first start training. Every breath is such a struggle. Life is the same way. We have seasons in our lives where the breathing is effortless, we don’t even realize we are taking a breath. We think little of it and it can be taken for granted. Then there are the seasons in life where every breath comes with effort and can be such a struggle. My path has crossed with a couple of friends where breathing has become a struggle. Not from running but from life. One dear friend is fighting for every breath (literally) as a disease ravages her body. One friend struggles for each breath since the unexpected death of her husband. And yet they breathe. God’s Word tells us “let everything that has breath, praise the Lord.” (Psalm 150:6) So how do we praise the Lord when every breath is a struggle? I have watched both ladies give praise to the Lord during these most difficult days. It wasn’t with a praise and worship song, it may not even have been through quoting a Scripture. What I have witnessed them both do is acknowledge the Lord in the midst of their struggle. They have both given credit to the Lord for their next breath, the very breath that has been so painful. I’ve been very blessed to watch and learn as these brave ladies praise the Lord with every breath. So for those who are in the season where breathing is easy… praise the Lord! Use that breath to thank Him. Use that breath for His Glory. If you don’t, the rocks and hills will do it. Actually they do praise Him, they just don’t need a breath to do it. For those struggling…praise the Lord. Not for the struggle but for the comfort that you won’t have to take one difficult breath alone. So if you can… take a deep breath! 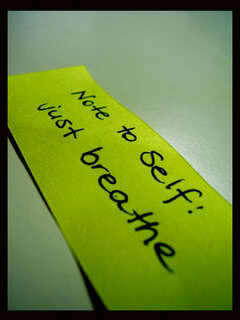 Go ahead… Breathe in… Breathe out…Thank the Lord for it. He alone gave you the ability to take it. This is so good. We do need to praise him for each breath, each moment we are alive! I have a friend going through such a hard time with family issues.